In 1999, a group of Boston area American Muslims who were home schooling their children decided to pool their efforts in order to provide our children with a richer learning experience. Drawing on a diverse pool of talented volunteers, we began to regularly meet to teach science, math, and language arts couched in a framework of moral values. We focused on literacy and inculcating a life-long love for learning. As time went on, we grew from a preschool cooperative into a fledgling elementary school. In 2001, we received approval to operate as a school from the superintendent of the Quincy School Department. 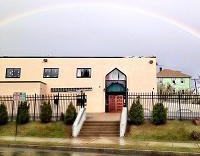 We rented space in the Islamic Center of New England and began operation as a full-time K-2 school. Over time, we expanded in an organized manner until we reached our current format as a K-5th full-time elementary school. We reached out beyond our original cooperative and began to offer our enriched learning format to the greater Muslim community. Our enrollment flourished and our school community took on a vibrancy that continues to attract families from a broad, though largely underserved geographic area. We worked diligently on developing a strong academic, morally grounded curriculum, which would prepare our students to become productive citizens, upholding core American values while still maintaining their Muslim identity. We assembled a dedicated team of qualified administrators, teachers, and consultants. With their assistance, we have been able to develop a rigorous and dynamic program of studies culled from the best of available curricula from Harcourt, McMillan-McGraw Hill, Pearson, and Noor Islamic Arts among others. Every subject is taught in a deliberate and measured way, bearing in mind the diversity of learning styles and abilities in our student population. Our growth as a school is evident in our regularly improving Terra Nova scores as well as the success of our graduates when assimilating into other school systems. Our teachers regularly participate in professional development. All of our teachers are certified or are actively working toward certifications. Students participate in science and multicultural fairs. They also excel in memorization of Quran. All grades from preschool through fifth grade learn Arabic as a second language. We are all very proud of the significant growth and success, which we have shown during the past ten years. As we have developed, the community has come to believe in and support our mission: To provide students with a challenging and stimulating environment that nurtures their natural desire to learn and teaches them to serve God by improving their own lives and the lives of those around them. We serve a diverse population of students from the United States, Asia, the Middle East, and Africa. Many of our students are taught as English Language Learners. We provide some assistance to parents of ESL students as to how they can maximize their children’s learning at home. Most of our families fall into the low-income range. Many also have multiple children, which adds to the burden of cost upon the families. Even though our parent population is a vital and enthusiastic group, they are limited in their ability to provide all the time and resources it would take to help with all the demands of a challenging education. Our parents rely on Mutanafisun to do the utmost to prepare their children for continued academic success. On average our student to teacher ratio is 8:1. Our dedicated teachers hold degrees in Education, Computer Science, Islamic Studies, Sociology, Biology, Business and Medicine. Each teacher brings his/her own valued contribution to the Noble family. We accent Arabic, Qur’an & Islamic Studies. All three subjects will be a regular, daily part of your child’s schedule. Our Arabic teachers are native speakers with 10 years of teaching experience. Our Qur’an and Islamic Studies teachers include a hafitha and graduates of Islamic Studies programs. Students’ linguistic skills are exercised in Language Arts and further developed, cross- curricular, through research, oral presentation and critical writing activities. Given their importance in a child’s academic career, foundational language tools are taught only by native English speakers from the U.S., Canada and Great Britain.